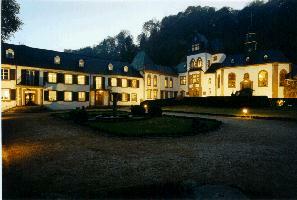 The International Conference and Research Center for Computer Science at Schloss Dagstuhl has a tradition of organizing seminars of high international standard on cutting-edge topics in computer science. The idea of the seminars is to gather a group of 30-40 leading scientists and young promising researchers to jointly discuss key ideas and research directions in their field in the very special atmosphere of the castle. Based on a proposal by the organizers, Dagstuhl hosted a Seminar on Ubiquitous Computing on September 9-14, 2001. The seminar did not follow the usual workshop formats but encouraged a high degree of collaborative discussion and work among the participants from research backgrounds such as computer science systems, smart technologies, and human-computer interaction. One of the objectives of the seminar was to shed light on the development from the different angles that researchers investigate, and to foster a community that cuts across computer science disciplines and neighboring fields of research. The following outlines the schedule followerd during the week of the seminar. Except for the invited presentation by Roy Want on the first day, all of the sessions were scheduled collaboratively and dynamically by all of the participants. The general format was that of having short presentations on a given topic in the morning, followed by a plenary discussion on topical break-out sessions. In the afternoon, small working groups of between 5 and 10 participants would then discuss one of the break-out topics each, and convene before dinner again to discuss the results of each working group in the plenary. Occasionally, a number of presentation would also be scheduled after dinner, though most of the time evenings were spent with informal discussions over snacks and beverages. See the Photoalbum for a collection of snapshots taken by the participants! The Dagstuhl Seminar on Ubiquitous Computing was organized by Gaetano Boriello (Univ. of Washington/Intel Research), Hans-Werner Gellersen (Univ. of Lancaster), and Friedemann Mattern (ETH Zurich). A complete list of participants can be found in the Introductions Handout prepared for the Seminar. Individual introductions, homepages, and contributions are listed below.